Each day leading up to the March 8 announcement of the 2011 NBCC award winners, Critical Mass is highlighting our thirty finalists. In a first, the NBCC is partnering with other websites to promote our finalists as well in the categories of Criticism and Poetry. Our Criticism finalists will appear on The Rumpus, our Poetry finalists will appear March 7 at O, the Oprah Magazine website. 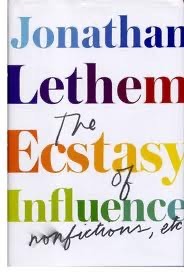 Here is #24 in our series, NBCC board member John Reed on Criticism finalist Jonathan Lethem's "The Ecstasy of Influence," at The Rumpus.